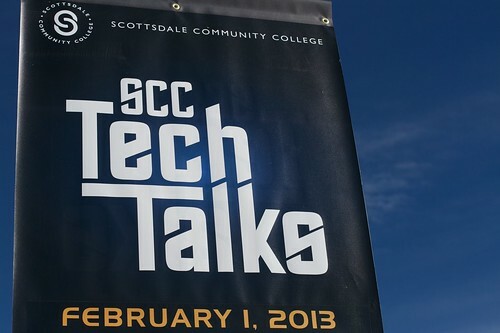 For many reasons it was exciting today to visit with friends and former colleagies at the Maricopa Community Colleges, visiting Scottsdale Community College today for a fantastic format idea for an event they came up with for TechTalks 13. It is vaguely familair to some guy named Ted, without the red logo and the staunch requirements. This was the baby and brainchild of Charles Pflanz, a series of 10 18 minute talks, and a refreshing change from the usualy conference format. Instead of th eusualy keynote and shuttling off to breakout rooms, the audience of 200+ stayed as one in the Performing Arts Center. Another really nice touch was having the opening and closing sessions be ones by SCC students. There were talks on filmmaking, gaming, MOOCs, online teaching, 3D printing, and the amazing closer on midi / guitar synthesizer music. The whole event was extremely well choreographed, and a ton of people were there to help, a big crew of them in the PAC. 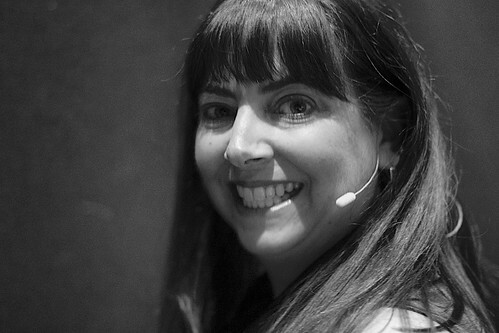 Kudos as well to friend and longtime Lisa Young for her high energy enthusiasm, organizing, and being an emcee. I also got to hang out (and harass her for not doing more ds106) with Cheryl Colan and visit Rachel Woodburn in the Art Department and catch up on their digital storytelling class there. The faculty workshop stories I recall helping with back in 2006 are still on the MCLI web site, and hold up well 7 yeats later. Charles invited me to do a talk, and I took some liberty in trying sometihng whacky on improv using my pechaflickr tool. The whacky part was I got the idea to actually use pechaflickr for my slides, so as I told the audience, I was nervouse because I had 43 slides to cover in 18 minutes, and this was the first time I had seen them. What I set up was a launcher for a series of 5 different pechaflickr rounds based on the words in blue, with a variable number of slides and different intervals for ach one. This maybe was cheating as I was able to configure the toiming to come in under 18 minutes. I went a little ove rgoofy, but it was fun. It was also impossible, standing on stage to see anything because of the intensite of the lights. That might have helped. A few photos came up that were just so bizarre I could not come up with anything. And later in the day, Charles kept coming up and suggesting new (and novel) ideas on hwo he could see it beung used for his economics classes. The irony is when I first told him about it, he said it looked neat but wondered about the educational applications. One of the new little addons I made to enable the site above is that you can now save the settings for a round and send it to someone else. So you can try running my set of slides on yawn (you will get different photos because it is random, but I bet half of the photos are of cats). This was fun, but it was more fun to visit again with colleagues I knew from my time at Maricopa. And a bonus was getting to have a CyberSalon Hangout in Scottsdale with a big crew, meeting Todd COnaway’s buddy Thatcher from Yavapai Community College and (I am sorry I forgot) a ver nice woman from NAU who was eager to try some improv activities. 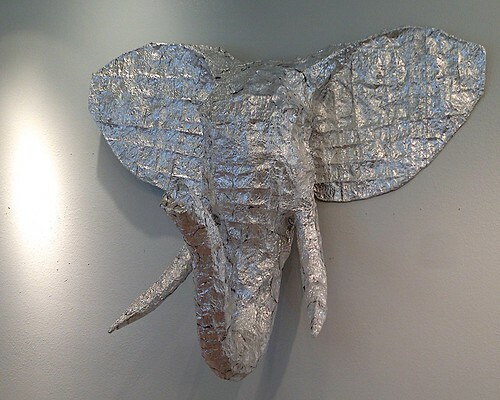 Heck, I even got to see a foil elephant. I love ted talks, so I’m sure this was a really fun and interesting event. I can’t wait to see the video of your presentation. I think your use of pechaflickr is really interesting and fun for an event like this. I would have probably had a heart attack though, because I’m not that good at coming up with stories or descriptions on the spot, especially when there is a time limit per picture!! That elephant is really awesome too! Also, this is my first comment on your blog and I really like how you have it set up. Obviously you are a professional, but I think the white background is perfect since you have 2 sidebars full of different info. Thank you Kaitlyn, I think you will go far in blagging.